The Severan Tondo, depicting Septimius Severus and (most) of his family. Lucius Septimius Severus was born to a family of Phoenician equestrian rank in Leptis Magna,the Roman province of Africa proconsularis, in modern-day Libya. He rose through military service to consular rank under the later Antonines. Proclaimed emperor in 193 by his legionaries in Noricum during the political unrest that followed the death of Commodus, he secured sole rule over the empire in 197 after defeating his last rival, Clodius Albinus, at the Battle of Lugdunum. Severus fought a successful war against the Parthians and campaigned with success against barbarian incursions in Roman Britain, rebuilding Hadrian's Wall. In Rome, his relations with the Senate were poor, but he was popular with the commoners, as with his soldiers, whose salary he raised. Starting in 197, the influence of his Praetorian prefect Gaius Fulvius Plautianus was a negative influence; the latter was executed in 205. One of Plautianus's successors was the jurist Aemilius Papinianus. Severus continued official persecution of Christians and Jews, as they were the only two groups who would not assimilate their beliefs to the official syncretistic creed. The eldest son of Severus, he was born Lucius Septimius Bassianus in Lugdunum, Gaul. "Caracalla" was a nickname referring to the Gallic hooded tunic he habitually wore even when he slept. Upon his father's death, Caracalla was proclaimed co-emperor with his brother Geta. Conflict between the two culminated in the assassination of the latter. Reigning alone, Caracalla was noted for lavish bribes to the legionaries and unprecedented cruelty, authorizing numerous assassinations of perceived enemies and rivals. He campaigned with indifferent success against the Alamanni. The Baths of Caracalla in Rome are the most enduring monument of his rule. He was assassinated while en route to a campaign against the Parthians by a Praetorian Guard. Younger son of Severus, Geta was made co-emperor with his older brother Caracalla upon his father's death. Unlike the much more successful joint reign of Marcus Aurelius and his brother Lucius Verus in the previous century, relations were hostile between the two Severid brothers from the very start. 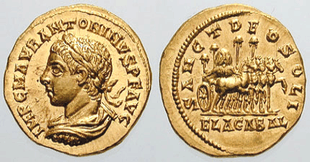 Geta was assassinated in his mother's apartments by order of Caracalla, who thereafter ruled as sole Augustus. M.M. Opelius Macrinus was born in 164 at Caesarea Mauretaniae. Although coming from a humble background that was not dynastically related to the Severan dynasty, he rose through the imperial household until, under the emperor Caracalla, he was made Prefect of the Praetorian Guard. On account of the cruelty and treachery of the emperor, Macrinus became involved in a conspiracy to kill him, and ordered the Praetorian Guard to do so. On April 8, 217, Caracalla was assassinated traveling to Carrhae. Three days later, Macrinus was declared Augustus. His most significant early decision was to make peace with the Parthians, but many thought that the terms were degrading to the Romans. However, his downfall was his refusal to award the pay and privileges promised to the eastern troops by Caracalla. He also kept those forces wintered in Syria, where they became attracted to the young Elagabalus. After months of mild rebellion by the bulk of the army in Syria, Macrinus took his loyal troops to meet the army of Elagabalus near Antioch. Despite a good fight by the Praetorian Guard, his soldiers were defeated. Macrinus managed to escape to Chalcedon but his authority was lost: he was betrayed and executed after a short reign of just 14 months. M. Opelius Diadumenianus was the son of Macrinus, born in 208. He was given the title Caesar in 217, when his father became Emperor. After his father's defeat outside Antioch, he tried to escape east to Parthia, but was captured and killed before he could achieve this. Born Varius Avitus Bassianus on May 16, 205, he became known later as M. Aurelius Antonius, and also as "Elagabalus," following the Latin name for the Syrian sun God Elagabal, of whom he had become a priest at an early age. Elagabal was represented by a large, dark rock called a baetyl. Elagbalus was proclaimed Emperor by the troops of Emesa, his hometown, under instigation by Elagabalus's grandmother, Julia Maesa. She spread a rumor that Elagabalus was the secret son of Caracalla. This revolt spread to the entire Syrian army (which, at the time, was swollen with troops raised by the Emperor Caracalla, and not fully loyal to Macrinus), and eventually they were to win the short struggle that followed by defeating Macrinus at a battle just outside Antioch. Elagabalus was then accepted by the senate, and began the slow journey to Rome. His reign in Rome has long been known for outrageousness, although the historical sources are few, and in many cases not to be fully trusted. He is said to have smothered guests at a banquet by flooding the room with rose petals: married his male lover - who was then referred as the 'Empress's husband', and married one of the vestal virgins. Some say he was transgender, and one ancient text states that he offered half the empire to the physician who could give him female genitalia. The running of the Empire during this time was mainly left to his grandmother and mother (Julia Soamias). 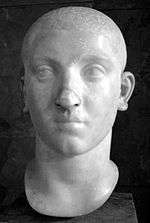 Seeing that her grandson's outrageous behavior could mean the loss of power, Julia Maesa persuaded Elagabalus to accept his cousin Alexander Severus as Caesar (and thus the nominal Emperor to be). However, Alexander was popular with the troops, who viewed their new Emperor with dislike: when Elagabalus, jealous of this popularity, removed the title of Caesar from his nephew the enraged Praetorian Guard swore to protect him. Elagabalus and his mother were murdered in a Praetorian Guard camp mutiny. Born Marcus Julius Gessius Bassianus Alexianus, Alexander was adopted as heir apparent by his slightly older and very unpopular cousin, the Emperor Elagabalus at the urging of the influential and powerful Julia Maesa— who was grandmother of both cousins and who'd arranged for the emperor's acclamation by the Third Legion. On March 6, 222, when Alexander was just fourteen, a rumor went around the city troops that Alexander had been killed and this triggered his ascension as emperor. The eighteen-year-old Emperor Elagabalus and his mother were both taken from the palace, dragged through the streets, murdered and thrown in the river Tiber by the Praetorian Guard, who then proclaimed Alexander Severus as Augustus. Ruling from the age of fourteen under the influence of his able mother, Julia Avita Mamaea, Alexander restored, to some extent, the moderation that characterized the rule of Septimius Severus. The rising strength of the Sasanian Empire (226–651) heralded perhaps the greatest external challenge that Rome faced in the 3rd century. His prosecution of the war against a German invasion of Gaul led to his overthrow by the troops he was leading there, whose regard the twenty-seven-year-old had lost during the affair. The women of the Severan dynasty, beginning with Septimius Severus's wife Julia Domna, were notably active in advancing the careers of their male relatives. Other notable women who exercised power behind the scenes in this period include Julia Maesa, sister of Julia Domna, and Maesa's two daughters Julia Soaemias, mother of Elagabalus, and Julia Avita Mamaea, mother of Alexander Severus. Also of interest is Publia Fulvia Plautilla, daughter of Gaius Fulvius Plautianus, the Prefect Commander of the Praetorian Guard, married to but despised by Caracalla who had her exiled and eventually executed.